Cons: The quality of this product is horrible. I orderd three of theses cables and on all three at least one wire was hanging from the bottom one. When i looked at it, the wire had just fallen out of the holder. Had to to fix every one, I plugged them into some old SATA HDD's I had for fear that the cable would be bad and ruin my HDD's. Thankfull they didnt. OKGEAR you really need to look it QOS, this is the third product i have purchased from you and this is the third time i have been very disappointed. But at least this time you got your measurements right and the cable was actually 20". Other Thoughts: Maybe I just got unlucky three times in a row but OKGEAR really lives up to it name when it comes to quality. The cables are OK GEAR for my computer. Pros: Seemed to work with a quality power supply. Cons: I had been having sporadic boot up problems, which I thought was due to my power supply. When I switched the power supply, the cable fried and took out one of my hard drives! All other connectors were fine using either power supply. Build quality is visually inferior to other SATA power cables. The wires are thinner and the pins wobble more, making it hard to connect. Other Thoughts: I'll be disposing every last one of these cables. Cons: Only one of the two SATA ports actually powered a drive, the end plug was defective. Pros: Pricey with shipping, but the local stores were lacking what I was wanting, so I guess the price was right. Pros: This does exactly what it said it would. Pros: this cable is pretty cool for custom case and tight spaces. most people make it work and close the case and forget about it. this makes it look good and it works. 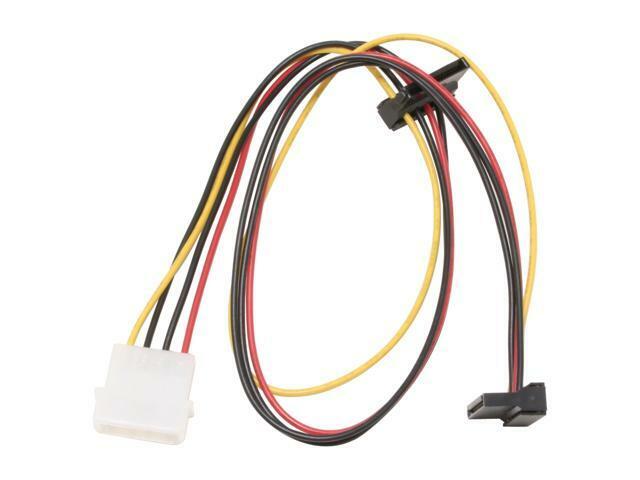 Other Thoughts: I actually bought a couple of these and took all of the sata connectors off. then, i took the sata connectors and put them on the three drives in my HDD cage and pressed the wires in, and sleeved the rest. it looks very clean, especially for cases with side windows. I did the same for the optical drives. now i have no power wires going across my case and blocking airflow and looking messy.